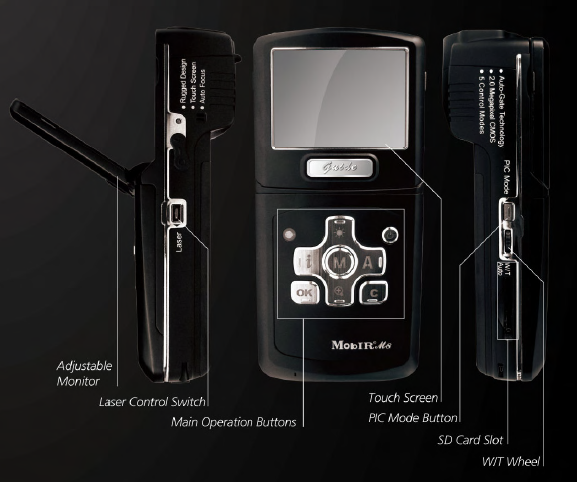 The MobIR M8 represents a landmark of Infrared technology progress globally. It is the latest innovation from Guide Infrared who always work with innovative ideas. Guide Infrared presents the M8, extending the features exclusively for the high-end Infrared camera which has never been done before. With a impressive 50Hz refresh rate, 2Mpixels CMOS, Touch screen, Auto focus, IR video recording, whatever you expect from a thermal camera, the M8 satisfies your needs by its compactness, ruggedness, accuracy, efficiency, reliability and affordability. MobIR is a mobile like infrared camera. ONE Unprecedented design of mobile like infrared camera. Three Perfect technology -combinations of optics, mechanics and electronics. Magnalium housing is far more robust and shock resistant compared with other plastic ones; Intelligent built-in lens design delivers overall protection for the optics even if you drop it on the ground by accident. The unique AGT offers double protection for the sensitive optics and detectors when it is off or in sleep mode. The optional silicon jacket offers extra protection. With the practical and innovative design the MobIR M8 improves the traditional ideas on infrared cameras. It is a mobile like instrument, small enough to fit in the palm of your hand and is integrated with the most advanced infrared technology. The innovative auto gate not only functions as a shutter but also as a lens cap. Free from all disrupting heat radiation caused by the optics and electronics inside, the intelligent external shutter delivers the most crisp and uniform image presentation as well as the most stable and accurate temperature reading. At the same time, it switches off automatically in sleep mode, providing extra protection to the sensitive optics and detectors. 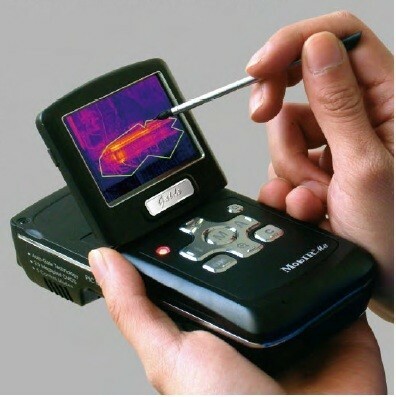 The classic mobile design makes this portable infrared camera very easy to operate. This palm sized camera, angle-adjustable LCD display enables you to reach every nook and cranny which means thermal abnormalities have got nowhere to hide. You can record live video on the device or into a PC via USB 2.0 which helps monitor temperature changes of the selected area, which is perfect for stationary monitoring. The image can be automatically captured through the following options: Every 15secs, 30secs, 60secs, and 5 min interval settings if necessary. With this function the camera can be mounted on a tripod for real time monitoring purposes. The automatic focus function is adopted in this light weight IR camera which is 160 x 120 pixels. Both clear infrared and visual images can be focused by simply pressing one button. The button! The Touch screen! The W/T wheel! The USB 2.0 or The infrared remote control! These 5 modes make the IR camera very fast and easy to operate. This portable IR camera with CMOS technology delivers high-resolution images and also allows you to make fusion images which allows for better spotting of potential problems. This latest Thermal Fusion technology allows you to overlay the thermal image directly on the corresponding visual image. It helps you identify exactly where the problem is. The unique touch screen allows for more advanced and complicated analysis that the buttons do not allow. The touch pen allows you to highlight/outline any irregularity that the thermal target covers, assisting you to get the most uniform and accurate measurement. The guide free software has a friendly user interface and is compatible with Microsoft operating systems. 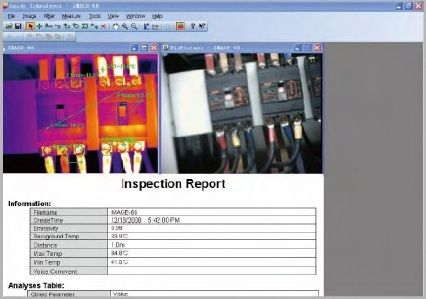 the software allows you to store and analyze infrared images and videos. The software has many advanced functions such as image processing, thermal fusion, automatic report generation in Microsoft excel or word etc and all kinds of analyses. The muti-language availability allows the user to select the language they are most comfortable with. This extremely long battery time ensures the user is not interrupted while working which means more work efficiency and they do not have to worry about the inconvenience caused by low battery power.